Some years back, I wrote about spending a couple of days in Savannah, Georgia. I called it New Orleans Lite. In fact, when I wrote that post I had not been to New Orleans, but I did know it by reputation and the experience of friends. 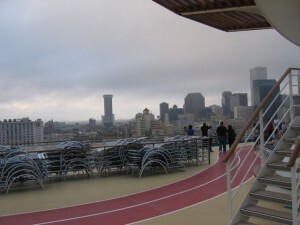 I still cannot claim to know New Orleans, having spent only one night in the city prior to departing on a cruise ship. But I have spent enough time in the city to be intrigued by the place, and to want to pay it a proper visit. Ambling around the area south of the cruise terminal on New Year’s Eve, I happened upon a small memorial to Hurricane Katrina, which nearly wiped out the city in 2005. There are doubtless large parts of New Orleans that are still unoccupied or damaged from the hurricane, but for the most part New Orleans feels vibrant and back to normal again. There was enough Friday rush hour traffic to slow I-10 through the center of town. Most of the passengers on the airport shuttle were destined for its famous French Quarter, there to celebrate a raucous New Year’s Eve the following day. The French Quarter is a bit like New York City’s famous Times Square: also a vibrant and sleepless place. It is also an eclectic and largely booze-filled area where just about anything feels possible. I am not sure why parents would want to bring their children to the French Quarter, given its high percentage of drunks and general misfits. There were also obvious prostitutes plying access to their junk in miniskirts on street corners. And yet there are children here, as well as buskers, galleries, lots of eclectic boutiques, a numbing array of bars, along with a sampling of pretty much every odd corner of America: from the 60’s hippie in stringy hair, to the Iowa corn farmer in overalls, to the staggeringly drunk. And yes, there are children here, generally closely supervised by Mom and Dad, but doubtless some runaways as well. The streets are so narrow that to make a turn vans like ours routinely have to climb over the curb. The French Quarter, which we inadvertently toured at some length as our driver deftly maneuvered us around numerous obstacles, is charming in spite of its stench and mixture of denizens. It’s not a good place to go if you want uninterrupted sleep. From my perspective, the French Quarter is to be admired because it is the exact antithesis of the plastic, generic and overly-corporatized America elsewhere. Not that you cannot find a Subway or a Starbucks among all the hotels with their ubiquitous iron rail balconies overlooking the streets. What you cannot find it something resembling silence. It is a section of a city that, like Las Vegas, never sleeps and never stops. New Orleans surprised me. It was much bigger than I imagined, with a dense urban core and plentiful towering skyscrapers. It is at the same time an old and lumbering city, and few places look older than its many cemeteries. The water table is too low to actually bury bodies underground, so instead there are above ground concrete tombs and mausoleums. They have a haunted look to them, lacquered as most of them are in decades, if not centuries of grime, mold and mildew. Apparently no one cares enough to clean them up regularly. Such attempts would be temporary at best, and perhaps spoil their spooky charms. Our destination for the night was actually the Latin Quarter, picked because of its plentiful hotels near the cruise terminal. A Spring Hill Suites seemed a sensible choice and turned out to be only four blocks from the cruise terminal. Most of the people in our hotel were staging themselves for cruises the following day, but some were here to see sites. There are many noteworthy things to see in New Orleans aside from its famous French Quarter, with the relatively recent World War Two Museum apparently being one of the better day trips for tourists. There are even Hurricane Katrina damage tours for those so interested, where you can visit vast neighborhoods of largely abandoned homes in the city’s south side, areas that were hit disproportionally because of their low elevation. For my wife and I, there was little time to do much more than sleep. However, I did find some time in the morning to amble down by the Mississippi River, in search of our cruise ship. For those who cannot wait for Mardi Gras, I found Mardi Gras World where you can sample some of the many floats from previous festivals. I eventually did find the cruise terminal, a bit down river from where Google Maps placed it, and closer to our hotel than I anticipated. There were actually two cruise ships berthed. The fancier of the two was our ship: Voyager of the Seas, a ship so large that when it was launched by Royal Caribbean in 1999 it was the largest cruise ship on the ocean. It remains impressive thirteen years later, but is now something of a smaller brother to its much bigger and younger brother, Oasis of the Seas. Next to our ship was a rather faded and frankly unattractive ship in the Carnival cruise line. Chatting with a family at our hotel on the Carnival ship, I discovered it was on the same voyage we were on: Jamaica, Grand Cayman Island and Cozumel, Mexico. For a while it was hard to make out more than the outline of our ships, given the foggy and cool weather in New Orleans. I eventually found Riverwalk, a shopping center next to the cruise terminal offering a simple route into our embarking station. Getting on our cruise ship took nearly two hours, so I was glad that we arrived early. By noon most of the fog was gone, but the sun proved elusive. Once on board, we were suitably dazzled by the Voyager of the Seas, which is over a thousand feet in length. We were perhaps less dazzled than we could have been, having finished a cruise with Norwegian some four-months earlier. I was anxious to see the lower Mississippi River, and particularly the Mississippi Delta but the sun set shortly after we departed and the fog quickly returned. Still, in the darkness one could discern much about the Mississippi Delta, and it was less than flattering. The area is rife with petrochemical plants, and it was not unusual to see or smell them from the river. Occasionally I caught the red and phosphorous-looking flare of a natural gas well. Being New Year’s Eve, residents along the river were in a mood to party. Those with fireworks seemed to time their modest displays with the passing of our ship. Eventually the fog obscured almost any view, except for the stars overhead and the occasional ghostly outline of the Carnival ship ahead of us. So we headed inside. The huge promenade on Deck 5 served as a convenient place for a New Year’s Eve celebration. Most of the passengers and crew were in formal attire. After a formal dinner in the dining room, where we warmed to our evening dining companions, we were in no mood to party, so we slipped back into casual wear. However, we did enjoy the festivities from a perch on Deck 7, where our cabin was located. Royal Caribbean provided party hats and horns for passengers, as well as a beautiful holiday display in the promenade, highlighted by an enormous Christmas tree. At the stroke of midnight we dutifully and noisily celebrated, while hundreds of balloons were released from nets on the upper deck. It was certainly a unique way to ring in 2012. We staggered into our stateroom, not from inebriation but from general tiredness. A few minutes on our balcony showed only channel lights. The Mississippi River had receded at last and we had entered the placid Gulf of Mexico. Orion displayed his majestic belt to our west. Our first destination, Jamaica, lay three days ahead of us.